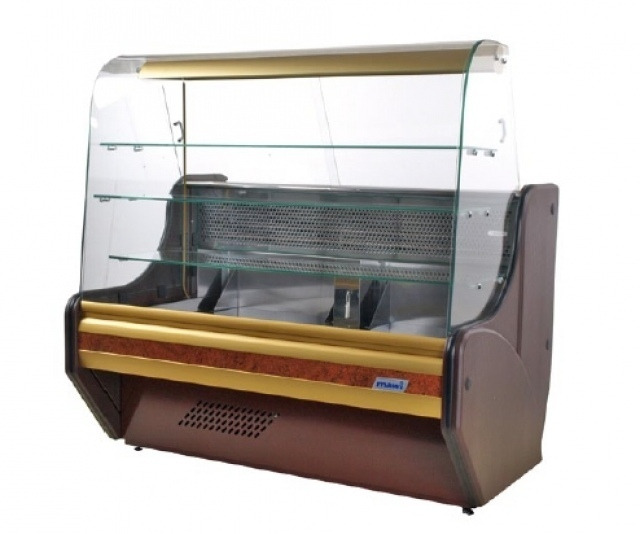 Confectionary counter with curved frontglass, brown powder coated basis (RAL 8016), sidewalls, decorative strip, silver or gold profile (choosable). The counter is equipped with gravitation cooling, automatic defrost, automatic evaporation of condensate, laminated worktop, display area made of stainless steel, drawers, night covers, lighting and adjustable feet. Colour of the decorative strip and the basis is available in the given RAL colours – it’s optional accessory.